"Maralie Arbo McBride, Westbrook College, Class of 1977"
Westbrook College student Maralie Arbo McBride, Class of 1977, was a Nursing major and a Day Hop. For her senior class candid photo, which appeared in the 1977 Tower Yearbook, she wore dark slacks and sweater vest with a long sleeve, flowered blouse. 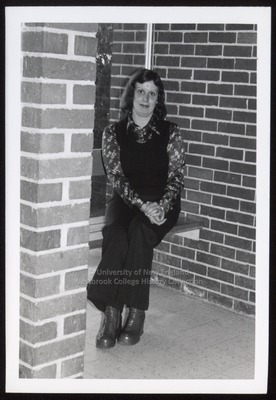 Maralie, with hands folded in her lap, sits on a wooden window bench between two brick walls, very possibly within Blewett Science Hall.